This very unusual English surname is locational. It originates from the village of Henstridge in the county of Somerset, being first recorded in the area in the year 1608 as shown below. The name translates literally as the ridge where horses were kept, from the olde English pre 7th century word "hyryyg", a ridge, and the later Anglo-Saxon word "hengest", meaning a horse. The actual meaning though, is open to different interpretations. As "Hengest or Hengist" were popular early personal names, this may give an alternative meaning of a village owned by a man called Hengest. In early history after the end of the Roman Occupation of England in 412 a.d., Hengist and his brother Horsa were reputed to be the leaders of the first Anglo-Saxon invaders in the year 488,. However this invasion was in Kent, a long way from Somerset. Locational surnames were usually "from" names. That is to say names given to people who left their original homes and moved elsewhere. In this case it would seem that a family called Henstridge were resident in the village of Kilmington in Somerset at the end of the Elizabethan period. 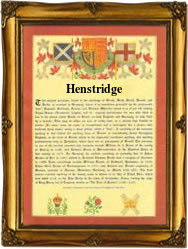 Early examples of the name recording taken from surviving church registers for the area include William Henstridge who married Jone Sandle at Kilmington, on February 20th 1608, and on Novemberr 10th in the same year and at the same place, what seems to have been his brother Stephan Henstridge, married Edith Lucas.